In my last post related to the economy in Libya, Khadijateri said "Are Libyans too lazy to carry coins? Are they [the coins] too heavy to lug around? Or is the problem that they are so difficult to count?". Last year Khadijateri had already noted : "Another thing I can't understand is why people here [in Libya] hate using coins. When they raise the prices on goods in the shops they usually add a quarter of a dinar because that is the smallest banknote used here. When I first came to Libya, in 1989, using coins was common. It certainly would be better if they went back to using them again and then only raising the prices a few cents at a time instead of in big chunks." I can't really state that Libyans hate using coins or are too lazy to do so, because we do use them overseas and we know how to and we also use them when available. The fact that at least in 1989 i.e . 20 years ago and some years after for sure, they were available is proof enough that we do love our coins. Are we too lazy or are the coins too heavy? Surely that can't be the case for all Libyans? Our salaries are not always a perfect round number but would be something like this : 300 Dinars and 0.631 Dirhams, if I get this in cash then I would either receive 0.500 Dirham or 0.750 Dirham depending on the mood of our cashier. But most of us receive our money in our bank accounts and so those precious Dirhams accumulate and I like it this way. We also would love the prices not to rise in such increments as mentioned above because the smallest paper denomination is 0.250 (or 25 ) Dirhams. Why buy 5 breads instead of one only ? The next logical question is why has the circulation of coins dwindled in Libya? (1) In the late 80's I remember reading in the local newspapers about the caravans of cisterns filled with coins that were busted on their way to cross the border to Egypt. Someone had been smuggling our coins outside the country. You can imagine how many coins can one cistern carry? But what would Libyan coins buy you in Egypt I used to think ? nothing really their value lay in the quality of the alloy they were made from. (2) Greedy Libyan merchants were hoarding coins in order for the price increase to be large. Instead of 5 or 10 Dirham they would 'have' to raise it to 25 at least. (3) The country was not minting enough coins. Whatever it was the circulation of coins continued to decrease slowly but surely. At one point coins became so rare that I started collecting them each time I actually came accross some. I have a small jar full now. 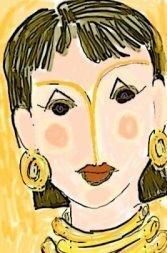 We learn to live with that especially during the sanction years, afterwards people were too busy consuming and becoming materialistic in their outlook. But now when prices have become astronomical due to inflation and our extreme hurry to catch up with capitalism many are wondering where are those elusive coins? 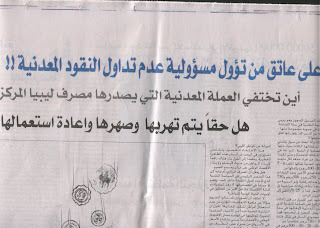 In my quest for the Libyan coins I saved an article from the Oea newspaper of November 8th 2008, issue no. 068 : " who is responsible for the non-circulation of coins? where have the coins that the Central Bank of Libya issued disappeared? Is it true that they are smuggled out of the country to be recycled? Is there a mafia that melts the coins to make sewage covers?". The author confirms that at least one old man he knew had started throwing the coins in the rubbish as too heavy too carry around especially since they are useless with the spike in prices. Also the merchants have been hoarding those coins for decades as this is to their benefit, and yes a 'mafia' was busted smuggling coins because the alloy could be smolten into other useful things or sold as scrap metal and they would still make loads of money. Once again this is a vicious circle, sometimes you don't notice things and when one does its quite late in the day. 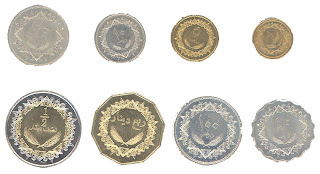 (1) The Central Bank of Libya (CBL) has been taking steps for some time now to combat this shortage by putting new coins into circulation at regular intervals. We've seen from the Wiki article above referenced that at least till 2004 some new coins have been punched out. Moreover, the CBL's website has a link to money issued and money taken out of circulation, and one of the sublinks refers specifically to coins. See the photo below, courtesy of CBL. We can see that there are 8 denominations ranging from 50 Dirhams to 1 Dirham and all are valid! (2) The merchants have been exponentially increasing prices following anticipated pay rises and that means for sure that they have been hoarding coins for a long time. So it's definitely a combination of circumstances but I can't believe that as stated at the beginning of my post that we are so irresponsible as to throw money or are simply lazy. For the last 3 months or so it has become very very common to get change in coins at least in 25 and 50 denominations which I'm always happy to accept and use, I've been surprised with a few 5 Dirhams as well in some government offices. Basically there is an effort and the supermarkets cashiers are full of shiny gold coloured coins. Hopefully this a good sign ! This all sounds like great news to me (regardless of the political system which is not my concern in this post.). What I was wondering about was the central bank governor in the same article I quoted above was saying i.e. that "average inflation is expected to fall sharply this year as a result of the decline of prices of food and other imported goods as well as the fall of the euro-Libyan dinar parity,". Again I'm no economist so I'm not able to project into the future but would appreciate someone explaining this to me. Does he mean that in quarter 2 or quarter 3 of the financial year prices will drop ? Because I thought that many commodities have definetely increased - check On the Edge "I couldn't BELIEVE how much food items have gone up ! A small jar of coffee that used to be 3.50 is now 6 dinars and the large would be 10 , when it was only 7 something last month". This is imported goods that she is talking about.But maybe supermarkets in Libya are making their own prices unrelated to the global situation. I think the eggs are cheaper but for sure car fuel has gone up it is now officially at 20 dirham per litre. To be honest I was embarassed at the gas station when I asked him to fill up my car for 5 Dinars and that barely reached half of the car tank. I thought the employee was cheating and regretfully it showed in my faces (even though I did not voice it) and he had to explain that prices had gone up. So basically if inflation goes down, will fuel, bread and food commodities decrease too ? How does this work ? "Thousands of people have contacted me to say that they have marched, cried at the television pictures and feel helpless in the face of the suffering. That’s why I have launched a major initiative in response to the humanitarian crisis in Gaza. I will be leading an aid convoy from London to Gaza leaving on 14 February and travelling through France, Spain, Morocco, Algeria, Tunisia, Libya, Egypt and through Rafah and into Gaza. It will bring material aid and raise the banner of Palestine in all the countries that we visit. I was aware from media activity that the Gaza Convoy initiated by George Galloway was going to pass through Libya, but since I was not following the news closely I was not aware it had arrived. So when I was driving in Tripoli yesterday afternoon I noticed a humongous traffic jam on the coastal road. I assumed there must have been some visiting VIP or a road accident. But as I got closer I noticed too many trucks too count and all had a Viva Palestina banner. Only then did I remember about this planned convoy. I mean many of us had already donated to the various charities and movements collecting money for Gaza even to the Viva Palestina cause . But it was one thing to read about it and another to see the sheer number of trucks and people surrounding them live. Can you imagine more than 5 lanes of cars stopped in the street - litterally parked alongside the trucks ! I was talking at that time to my best friend and mentioned the trucks to him, he suggested I take a photo with the cellphone and I really did want to join the group and shake some hands and take a few photos but I was driving on the other side of the road separated by concrete - it would be suicidal to stop and run accross the road. It was definetely a great sight anda lump rose in my throat...not just for Palestine but also the incredible emotions of my Libyan brethrens. I knew that the visitors would have a grand time in Libya - because being hospitable is what we do best and I'm not counting the trucks filled with goods that Libya has donated to this cause this time again. "This is the best welcome we received. What is different this time is that the authorities did not try to stop the people mingling and getting close to us, nothing was orchestrated, it was natural and spontaneous.." [Viva Palestina website]. I'm happy to hear that they will be allowed into Gaza from Egypt! Well done to all.